Around the Hotel we offer various options for sporting activity for young and old. Our sports facilities are described in brief on this page. From Easter to October, 3 tennis courts are available for use free of charge right next to the Hotel. Hire racquets and balls are available, and you can book a tennis instructor. The courts are also available for day guests. Click here for more information about tennis at the Glocknerhof. Archery is always in season. You can use our range with 3 targets and 2 animals with your own equipment in summer and winter. We offer free archery courses every week for people who are interested, and we provide the equipment for these. 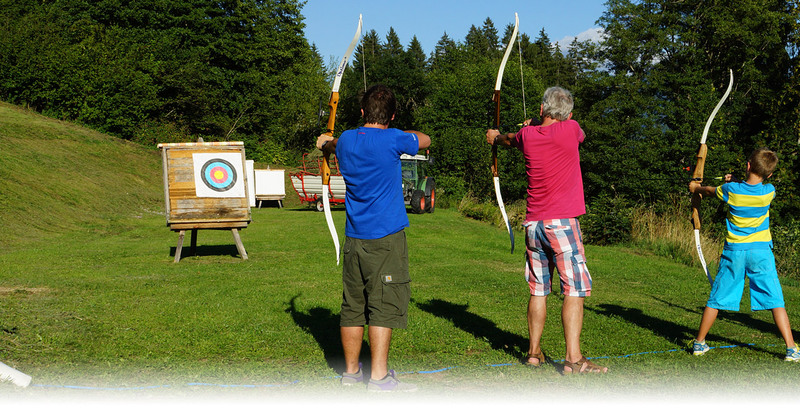 Click here for more information about archery at the Glocknerhof. The large children’s playground with its Rapunzel castle, climbing frames, swings, seesaws and the animal enclosure can be used all year round. In summer go-karting takes place on the car park near the playground using real engine-powered go-karts – which is popular with adults too, of course. Click here for more information about facilities for children at the Glocknerhof. The excellently maintained golf course in Berg im Drautal is well-known far beyond the border. As a guest of the founding hotel, the Glocknerhof, you will receive a 30 % reduction. The course has become established as a short game training course. The low-priced membership fees are especially attractive, so the Berg golf course provides numerous memberships to guests who spend their golfing holiday in the Drau Valley every year. There are also other golf courses nearby. Click here for more information about golf at the Glocknerhof. Around the Hotel there are many smaller and larger meadows and grass areas which are popular for playing ball games. The small area between the vegetable garden and the Hotel for example is ideally suited to badminton, volleyball and penalty kicks. A field in an idyllic woodland glade is perfect for football. Click here for more information about facilities for children at the Glocknerhof.